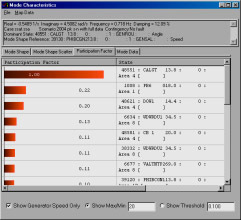 SSAT is a software tool designed for power system analysis with linearized system models. It includes a number of analysis functions, in both frequency- and time-domain. Study tools are provided for addressing specific problems, making it ideal for investigating oscillatory behavior in power systems and for designing and tuning controls to improve system damping. Like VSAT and TSAT, SSAT can be used to calculate small signal security limits under specified criteria, contingencies, and transfer conditions. Various eigenvalue solvers for specific types of modes, such as inter-area modes, local modes, etc.